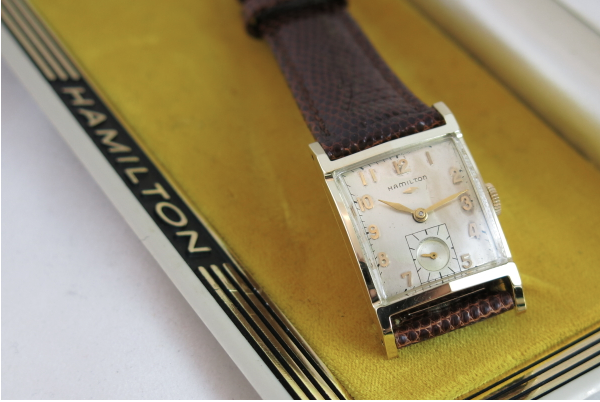 It's rare that I get my hands on a vintage Hamilton where I know the original owner. Like most collectors, I caught the bug by inheriting some family pieces. But 99% of the watches I've seen have been "anonymous" to me. My favorite watches are Christmas watches - given with love as presents with an inscription engraved on the back. To me, those are very special watches and even though I may not know the parties involved, I like restoring them so the sentiment in which it was given will carry on. I recently received an extra special watch to work on. There are several aspects that make it special to me... 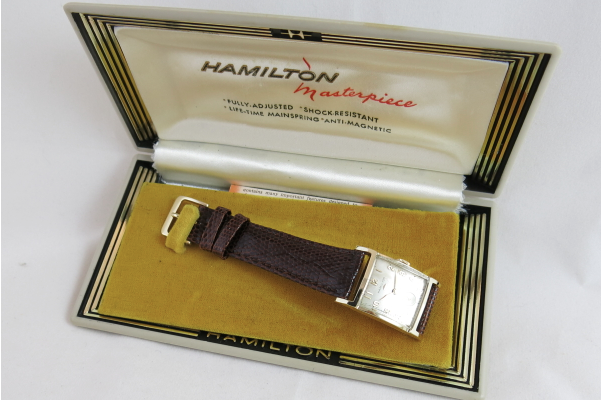 I've known the owner my whole life, it's a Christmas watch, it was carried in the Vietnam war, and it's a Hamilton. The watch is a 1962 Stafford. 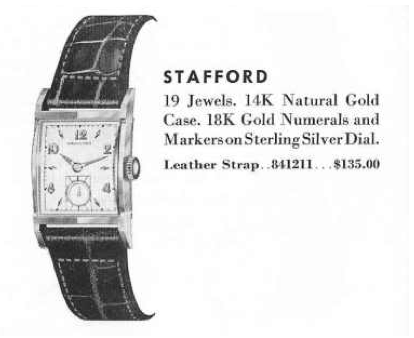 The Stafford was initially introduced in 1953 and it was made for 10 years... a very long time for a Hamilton model. Most models were made for five years or less. Very few were made for more than 5 years - let alone 10. The Stafford came in a solid 14K gold case. Several dials were available, depending upon the time. Each was sterling silver with solid 18K gold accents. There are two different numeral / marker dials, a masonic dial, and a less common all numeral dial. 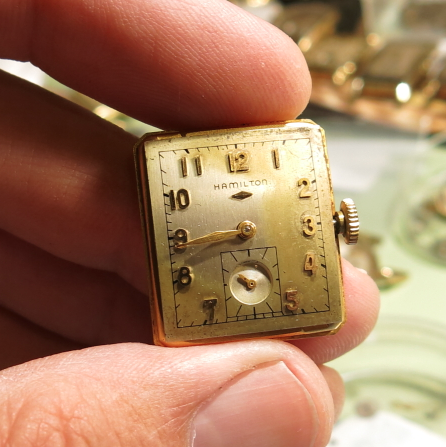 Early on, the Stafford had a 12/0 sized 19 jewel 754 Medallion movement. 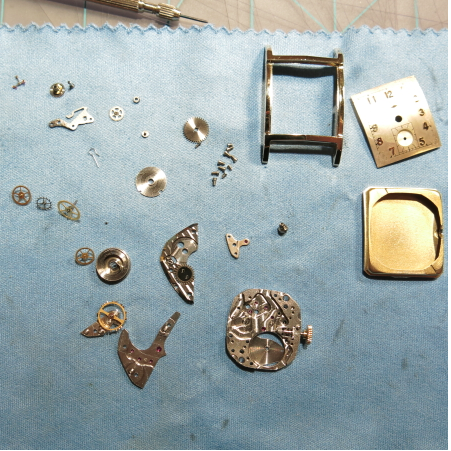 The 754 was replaced by the 12/0 sized, 22 jewel 770 movement when it was introduced in the late 1950's. So you can approximately date a Stafford by the type of movement under the hood. 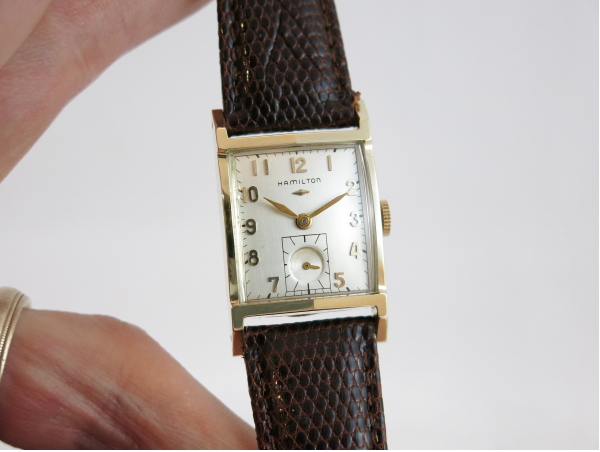 The watch I worked on was a 1962 model - I know that because it's inscribed 12-25-62 on the back. This watch arrived with it's original box - which is always interesting to see. I had not seen this style box before - it's for a strapped model and one side of the strap goes through a slot in the velvet backing so the watch will lay flat. This watch arrived with an after-market Spedel bracelet. I'm not a big fan of this style bracelet because the ends are spring loaded to accommodate a variety of lug widths. Eventually the springs will wear grooves into the case. As fate would have it, the spring bars were frozen solid so I had to cut the bracelet to get it off. It will look nicer on a strap anyway. It's a little hard to tell in the photos but the dial finish has been compromised by a cracked crystal. Moisture has gotten in there and lifted the varish off the dial. I'll try to clean it up but this usually doesn't bode well for the results. 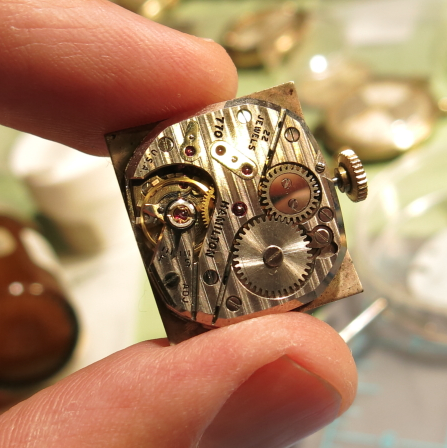 One the other side of the dial is the 22 jewel 770 movement. 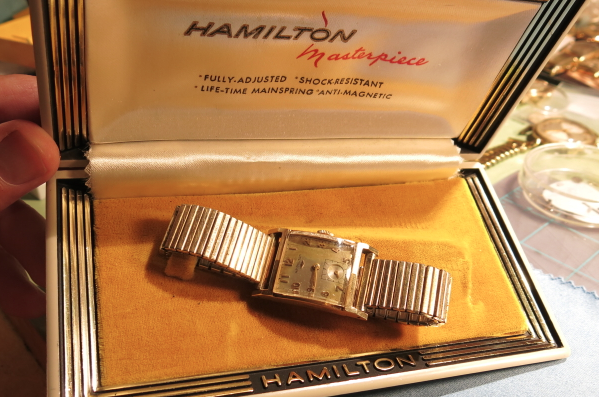 This is regarded as the best movement Hamilton ever made... it's shock jeweled and there are cap jewels over most of the wheels to prevent dirt from getting inside the bearing surfaces. My camera didn't pick up the case back markings too well. The best thing about 14K gold cases is you don't get the green funk (called verdigris) that gold filled cases will usually exhibit. 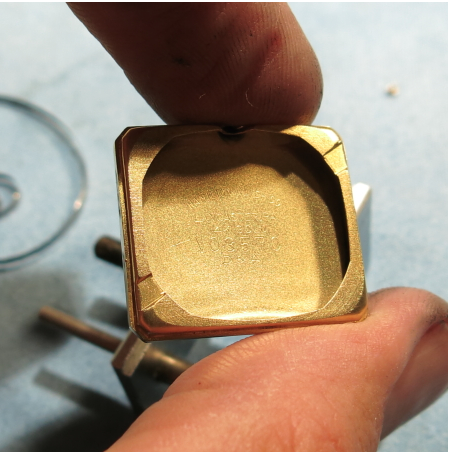 There's only one watchmaker mark inside - indicating that this watch was only serviced once since 1962. All the parts are cleaned and ready to be reassembled. The dial cleaned up "okay" but I lost some of the printing in the compromised areas. You'll see it close up later on below. 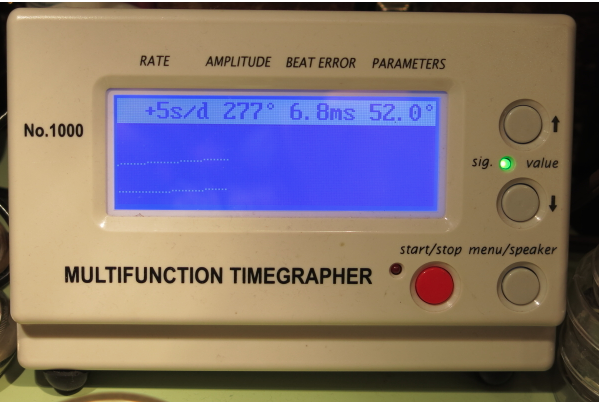 With everything put back together and regulated, the watch is running with very good accuracy and amplitude. The "beat error" is 6.8 ms. That's not great but it's tricky to adjust in this movement. You adjust the beat error by adjusting the hair spring stud relative to the balance impluse pin. The stud is fixed on this movement so you need to rotate the other end of the hairspring on the balance staff - which is usually a great way to goof it up. So I'll leave it as-is. The beat error is how far the balance rotates to one side versus the other. If it's zero, then each side swings the same amount. 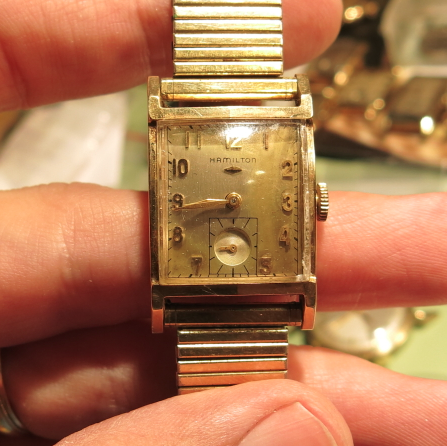 If it's "too high" the watch will stop a little sooner (as the mainspring lets out) than if the beat error is lower. With a 19mm genuine lizard strap, this Stafford is almost ready to go home to it's rightful owner. I want to install a new crystal so moisture will stay out of the case. It will also look a lot better. And here's a better shot of the dial. It looks better than before but with the lost marking it's a good candidate for a refinish. It can be redone to look like new. It's a tough call though... it's battered look tells the story of it's life. This watch went to Vietnam for a few years and served it's owner and it's country. Maybe we can cut it some slack for being a little rough around the edges. We decided to go the distance and get the dial redone so now it looks as good as new. Great work as usual Dan. I always enjoy learning more about all these different models. The fact that that piece went to Nam and back makes it all the more special. Kudos! Contact any of the eBay sellers with lots of Hamilton crystals and they will likely have what you need. Alinacrystals comes to mind but there are several. This is truly a masterful restoration.